CHENANI/BANI, Apr 6: Taking a dig at the Congress and other opposition candidates who are crying hoarse day and night to claim that they are unable to see any development in Udhampur-Kathua-Doda after 2014, Union Minister and BJP Lok Sabha candidate from Udhampur-Kathua-Doda Parliamentary constituency Dr Jitendra Singh said here today that even the Congress campaigners are travelling on roads constructed by BJP, but they are unable to appreciate or acknowledge development because they are blissfully living in a denial-mode. Addressing a series of meetings in the hilly areas of Latti and Pancheri in Chenani Assembly segment and Machhedi and other spots in Bani Assembly segment, Dr Jitendra Singh said, most of the villages today in the constituency have been connected with the main road under Central PMGSY scheme, but let us not forget that PMGSY scheme was started by BJP Prime Minister Atal Bihari Vajpayee, after which it was put on back-burner during the 10 years of UPA rule and has been revived only after the Modi Government took over in 2014. The Congress campaigners, he quipped, are new to the region and therefore they are unable to realize that till 2014 many of these roads on which they are travelling in motor cars today, were either tractor-roads or Kachha-roads for journey on foot or on pony. He recalled that during the 2014 election campaign, he had travelled to Jodhpur Block in district Doda on a pony, but he felt extremely proud and elated when he travelled to the same spot again a few months back on a motor vehicle. 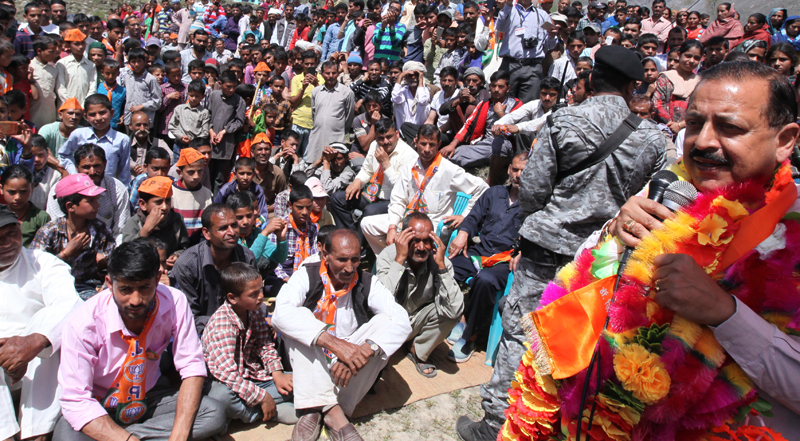 Out of a total package of Rs.3800 crore in 2018-19, as much as Rs.1700 crore was allocated for Udhampur-Kathua-Doda, as a result of which most of the PMGSY and Central Road Fund projects / proposals have been accomplished and the new ones to be proposed will be taken up in the coming years. It is, in fact, for the earlier Congress – NC and UPA regimes to answer as to why they neglected construction of critical roads in the constituency, like for example, Udhampur-Gordi road which was in a shambles and now the road construction has started for the last two years or the bridge on Udhampur-Ramnagar road which had been a popular demand for several decades or the Devika bridge. Dr Jitendra Singh said that in Chenani Assembly segment alone, virtually all the pending proposed PMGSY and CRF Road projects have been cleared, whereas in the Banni Assembly segment, the local representatives themselves admit that so much has been done for the area, that they have no more projects to ask. Not only this, Dr Jitendra Singh said, historic road and bridge projects of national-level have been constructed during the period of five years, which include the Chhattergalla Tunnel for which survey is going on by Beacon under BRO and will connect the highway from Banni to Doda from Lakhanpur. Similarly, he said, Khilaini Suddh-Mahadev tunnel could never have been visualized, but today it is a reality, and the same is the case with the Kaljugar tunnel. To those who are unable to appreciate the road development projects either because of their ignorance or because of their incapability, are welcome to check with the Ministry of Road & Highways that the survey is going on for India’s longest express road corridor from Katra to Delhi, which will reduce the travel time between these two destinations to just about six hours or so. Dr Jitendra Singh also referred to three Degree Colleges and Kendriya Vidyalayas recently approved for Chenani Assembly segment. MLA Chennai Dina Nath Bhagat, MLA Udhampur Pawan Gupta and MLA Bani Jeewan Lal accompanied Dr Jitendra Singh during the day-long meetings.